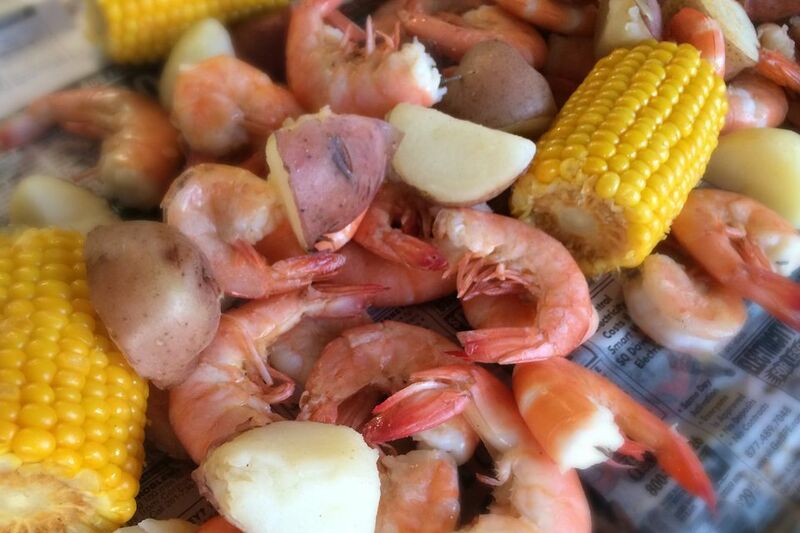 This recipe for a low country boil is a simple one. It is recommended to use about 1/2 cup of Old Bay seasoning or Zatarain's Crab Boil for every 5 to 6 quarts of water. This recipe is also called Beaufort stew or Frogmore stew and is so named for places in the Low Country of South Carolina. Although, this dish is not a stew at all—it is the epitome of a one-pot, boiled meal. Frogmore is the mailing address for the residents of St. Helena Island just off the South Carolina coast, and Beaufort is a city on Port Royal Island, another one of South Carolina’s coastal islands. The quantities in this recipe vary based on the number of guests you are expecting. You will want to adjust your water level and seasoning based on the amount of shrimp you cook and the number of people you serve. You will need at least a half-pound of shrimp per person. You will want at least one full-sized potato per person, too. Bring the seasoning to a boil in the water and follow the directions. All the equipment you need for this shrimp boil is a huge stockpot and a burner (or campfire). In a huge pot, bring red-skinned potatoes to a boil and turn down to medium (or if on a campfire, elevate it so it is less directly on the flame) to cook for about 20 minutes. Add small sections of corn on the cob, onions, and sections of big link sausage, such as Polish sausage (kielbasa) or spicy andouille. After 20 minutes, the potatoes should be done. Make sure the water is just up to the top of the ingredients in the pot and add at least a 1/2 pound of (shell-on) shrimp per person to the pot. Put a lid on the pot and turn the heat up; steam the shrimp for about 5 minutes, or until they are cooked through. When done, the shrimp will be opaque and pink in color. Remove the shrimp to a serving bowl and pile the vegetables and sausage onto serving platters. Don't overcook the shrimp: Overcooked shrimp become tough and chewy. If the shrimp start curling tight, they are overcooked. Presentation: Drain and dump the boil out on a table covered in newspapers for a fun mess of a meal. Add zing: Cut up a lemon or two and add to the boiling pot. Add more depth of flavor: You can add a bottle of pale ale beer to the water before it starts to boil. Condiments on hand: Upon serving, some people like their boil with tartar sauce, some prefer cocktail sauce, and other like hot sauce. Have all available to meet your guest's preferences. Spice it up: To spice up your boil, the choice of sausage added can affect the flavor profile. A spicy andouille sausage may give your boil just the kick it needs. Add or substitute crab or crawfish: For even more seafood options, add or substitute fresh, cleaned crab or crawfish. If you are adding, proportionally add more potatoes, sausage, corn, onions, seasoning, and water.